These findings will help scientists better forecast changes to the weather and climate by improving understanding of the influence of the ocean upon them. 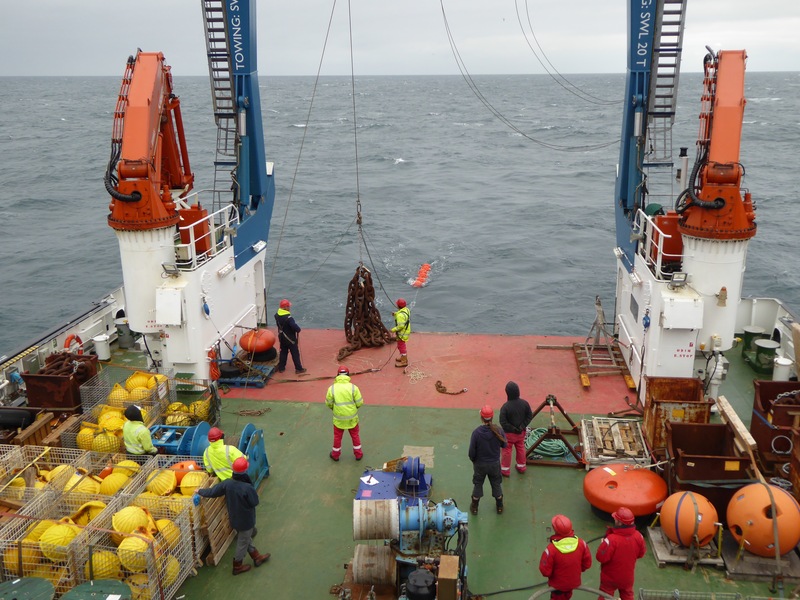 The study focused on part of the Atlantic meridional overturning circulation (AMOC), a system of ocean currents in the North Atlantic responsible for the transfer of huge amounts of heat from the ocean to northwest Europe, keeping its climate relatively mild. National Oceanography Centre (NOC) scientists collaborated on this study alongside colleagues from 16 research institutions across seven countries. The prevailing scientific view, based on modelling studies, had been that most of the AMOC’s overturning and variability occurs in the Labrador Sea, off Canada. Whereas this new research, published in the Journal Science, shows the overturning and variability actually happens in regions between Greenland and Scotland. There, warm, salty, shallow waters are carried northward from the tropics by currents and wind, sink and convert into colder, fresher, deep waters moving southward through the Irminger and Iceland basins. “These findings, unexpected as they may be, can help scientists better predict what changes might occur to the Atlantic meridional overturning circulation and what the climate impacts of those changes will be.” said Susan Lozier, the Ronie-Rochele Garcia-Johnson Professor of Earth and Ocean Sciences at Duke University’s Nicholas School of the Environment. This paper is the first from the £24 million, five-year initial phase of the OSNAP (Overturning in the Subpolar North Atlantic Program) research project, in which scientists have deployed moored instruments and sub-surface floats across the North Atlantic to measure the ocean’s overturning circulation and shed light on the factors that cause it to vary. Lozier is lead investigator of the project, which began in 2014. "As scientists, it is exciting to learn that there are more pieces to the overturning puzzle than we first thought," said co-author Johannes Karstensen of the GEOMAR Helmholtz Centre for Ocean Research Kiel, in Germany. "Though the overturning in the Labrador Sea is smaller than we expected, we have learned that this basin plays a large role in transporting freshwater from the Arctic,” Karstensen said. “Continued measurements in that basin will be increasingly important,” as the Arctic changes unexpectedly. Co-authors hailed from Duke; the UK’s National Oceanography Centre; Woods Hole Oceanographic Institution; the Scottish Association for Marine Sciences; the Royal Netherlands Institute for Sea Research and Utrecht University; Memorial University in St. John’s, Canada; GEOMAR Helmholtz Centre for Ocean Research in Kiel, Germany; and the Bedford Institute of Oceanography in Dartmouth, Canada. They were also scientists from the University of Miami; the University of Oxford; Scripps Institution of Oceanography; the Ocean University of China and Qingdao National Laboratory for Marine Science and Technology; the Laboratoire d’Oceanographie Physique et Spatiale in Plouzané, France; and the University of Liverpool.